I am Director of the Stockholm International Peace Research Institute. From December 2003 until August 2015 I was Secretary General of International Alert, the London-based international peacebuilding organisation. And from 2013 till 2017 I was also a part-time Professor of Peace and Conflict Studies at the University of Manchester, where I was affiliated with the Humanitarian and Conflict Response Institute. Before International Alert, I was Director of the International Peace Research Institute, Oslo from 1993 to 2001. I have written books, articles and reports about conflict, peace, security and international politics for 40 years or so and I have worked with divided communities so they could try to enhance their prospects for peaceful relations. I was a member of the UN Peacebuilding Fund‘s Advisory Group from 2007 through 2011, and chair of it in 2010 and 2011. In July 2009 I started out on what a friend called Fatherhood v2.0.It’s one reason why there are intermittent silences on this blog (my verbosity is another – if I were to write shorter blogs, I’d probably write more of them). In addition, in August 2014 I became a grandfather. And then in February 2015 I became a grandfather again (if you see what I mean) and again in July 2016. So: sorry about the blog but from time to time (like every week) there is a bigger priority. And by the way, thanks for asking: while grappling with the realities of parenthood with dodgy knees and uncertain about my future as a septuagenarian father of a teenager, I am still loving Fatherhood v2.0. 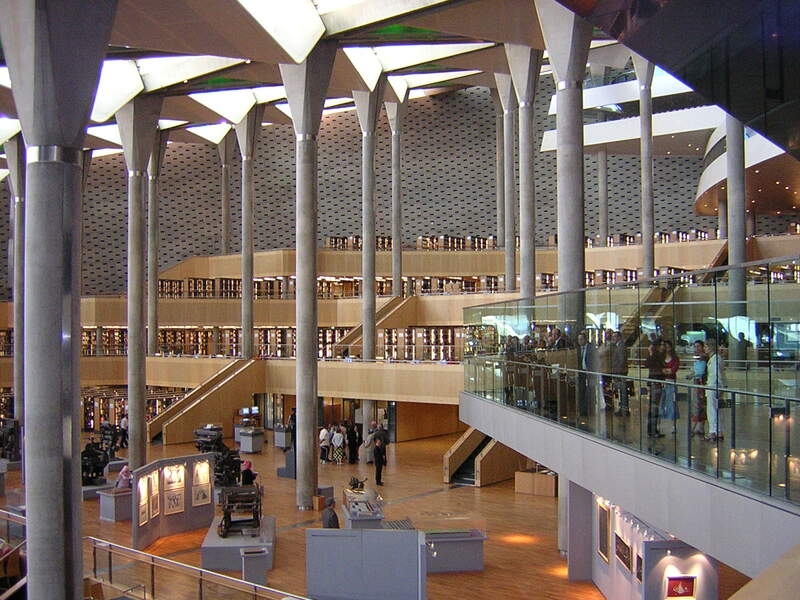 The picture at the top of the page is of the main reading room in the Library of Alexandria. Here’s another. It’s the modern one, obviously, not the ancient one that was founded about 283 BCE and whose destruction remains an unsolved mystery. The building is beautiful and the institution and the way it is run reflect an inclusive, reflective idea about education, learning and civilisation. The more I learned about Egypt under Mubarak, the more extraordinary it seems to me that the library could be founded and run in the way that it was. In the events that overthrew Mubarak in February 2011, the Library emerged unscathed. In whatever future unfolds for Egypt now, the survival of the Library of Alexandria may be a useful litmus test of freedoms and values in the country. Visit it if ever you have an opportunity – it really is wonderful. Long time, no see. Congratulations on fatherhood revisited. Us older dads have much to offer, I like to think. My eight-year-old son, Conrad, is pure pleasure, and keeps me busy. I’ll keep in mind the Library at Alexandria. I am getting touch with you on behalf of the Institute for Economics and Peace (IEP) to let you know that this year’s Global Peace Index (GPI) will be launched on June 12th. Having covered the GPI previously, we thought you might be interested in receiving this year’s ranking. We will be in touch closer to the launch with GPI results, interactive maps, videos and charts; however if you have any question or would like to speak to someone from the IEP about the GPI, feel free to get in touch before then. If, for whatever reason, you are not interested in this year’s GPI and do not wish to be contacted on the subject do please let us know and we will remove you from our contact list. Thank You so much for your inspiring work! Could we at Positive News US get a copy of your recent State of the World Atlas for review? To ditto Ilonka, your work is inspiring. I (along with a group of young writers) are looking for some great minds to help launch our new website discussing various global issues. I wondered if you had any work that you would like to share with our readers, or perhaps a copy of your fantastic article ‘Natural Resources in a Conflict Context’? It would be great if your writing was shared further, and great for us to have some work written by more experienced writers such as yourself. To echo another writer, even longer time no see. I was, oddly, walking past Christ’s with Charlie Hodges on Saturday night, who you may or may not remember at Tiffin (he would also have been at Jesus when you were around), on my way to a Tiffin ‘dinner’ at Emanuel – it was mostly an excuse to catch up with Charlie and otherwise an opportunity to meet some people I don’t know now and wouldn’t have wanted to know forty-five, getting on for fifty, years ago… Anyway, this is to say hello. The last time I saw you was very briefly at the Oxford Union in 1973ish. I am intrigued you are living in Stockholm. My wife’s mother was Swedish and I know the city quite well. I now live in Ireland, and have done for the last twenty years. Like you I am a father of a certain age, for a variety of reasons, and being hopefully kept young by two children of now ten and twelve. Anyway, the short version of this is only that Charlie and I were thinking about you on Saturday and I thought I would put your name into a search… Good to see you again…! Sir , I also write about international political issues . I am interested in working with you and under your guidance . So , can I write for your blog . Please consider my application. My name is Erica Badino, I’m a blogger with a focus on financial advice. If you are the author of Philosophy 50 moments, a wonderfully succinct compendium, you will want to note a Freudian slip on page 29, last sentence in section entitled Wisdom of the Oracle. (In my own slip I first typed auricle). The slip is Aristotle. Hi Mr. Smith, I’ve been using your State of the World atlas since I was a kid in middle school, all the way through high school and multiple Stanford degrees, and when the 9th edition came out I bought copies as gifts for my younger sibling and friends. They are truly incomparable visual resources. I was wondering if a 10th might be on the horizon anytime in the foreseeable future, and if so, would you still be editing them? Thanks! Sorry – not something I have data on.